The book of Acts is a record of a people who were obedient to that command. In Jerusalem - God gave to his own a great message, and an idea whose time had come was ready for launching. This was no social club, it was a dynamic fellowship with a one-track mind which spent itself winning persons for the Lord Jesus. It was called into existance by God, directed by God, and empowered by God to be his working arm in history. It was the fellowship called the church! The Fellowship Increased in Number - The growth of the church after Pentecost was phenomenal. On Pentecost Day itself, 3,000 believers were added to the list of the faithful. And as time moved on, many who were estranged gave up their rebellion against God and joined the legions of the redeemed. The Fellowship Was Unified and Dispersed by Persecution - Opposition was inevitable. As Jerusalem's streets became crowded with Christians, the leaders of the Judaist party had cause for increasing alarm. They suspected trouble from the very day that the guards had brought back the bad news of the empty tomb. Even then they had taken action to counteract the impact such news might have on the rank and file of their own people, but their scheming plan had not worked. The strange circumstances surrounding Pentecost, Peter's convincing arguments from prophecy and his proclamation that even David had declared Christ's resurrection from the dead all combined to produce an exodus from Judaism to Christianity. Add to this the miracles wrought by the apostle's hands and the effect which these signs had upon the observers; and it should come as no surprise that the apostles were soon arrested and taken into custody. For they were little Christs, peddling the same dangerous doctrines of their Master, and these little fires had to be put out, and quickly. So thought the leaders of Judaism. The disciples were warned to stop preaching in their Master's name, they were cast into prison, and when the prison didn't hold them, they were threatened with death. Released with a beating and another warning, they went on preaching as if nothing had happened! The fires in Jerusalem lighted by Jesus the Christ and fanned into a great flame by the outpouring of the Holy Spirit would not be put out. Not even spilled blood of the saints could dampen the enthusiasm for the message which promised the keys to a kingdom. The great persecution which began in the Holy City at the juncture of Stephen's death, issued in a dispersion. Those called by God, bearing their crosses, left Jerusalem's walls and carried the message of salvation into all Judea and Samaria. In Judea and Samaria - Who had cared whether the Samaritans lived or died, except Jesus? All during his ministry, Jesus had attacked the smug, exclusive thinking of separation for its own sake. He told his followers on numerous occasions that they had been blessed to be a blessing; and now Philip, a recent convert, was demonstrating that he understood. Yet, the witness in Samaria did not comprise a total breakdown of separation. These "half-breeds," hated by the Jews, worshipped God, and shared in the traditions and the heritage which belonged to the Hebrew people. Hence, when Philip went to the Samaritans, he was in a sense, going to his own people with the message of salvation. Total Breakdown of Separation - As bold as Philip's move was, it was not as revolutionary as the step which Peter took. Peter's vision which, when interpreted and acted upon, literally shocked the followers of the Way. Jesus had acquainted his disciples with the universality of God's love many times, but somehow, his followers had not understood what the Master was doing or saying until the Holy Spirit came to enlighten them. The revelation that the message belonged to Jew and Gentile alike came as if it were a totally new idea that had never been expressed before. Peter's vision and the experience with Cornelius opened the eyes of the devoted followers of Christ. Now, and not a moment before, the saints were ready to carry the banners of Christ to the far ends of the world! Unto the Ends of the Earth - The great crusader, Paul of Tarsus, was being prepared by God to take the message of the cross to Jews and Gentiles everywhere. Here was God's trailblazer, who with a relentless energy and a magnificent power gained from God, hurled the message of Christ around the world. Paul and believers like him proclaimed a Redeemer who was more than an example, more than a teacher, more than a friend, more than a Savior. Indeed, Christ to Paul and to the early Christian church, was no less than Sovereign and King and Lord of life! Small figures approaching walled city - Jesus' disciples go to Jerusalem to await the promise of "power from on high." Walled city, green pastures, and globe - The fellowship of believers is commanded by Christ to proclaim the message of his lordshi to all peoples. Three spires within walled city - The Jerusalem experiences accomplished three significant things for the early fellowship. First Spire - The fellowship was empowered. Second Spire - The fellowship increased in number. Third Spire - The fellowship was unified and dispersed by persecution. Arched doorway in city wall and pathway to green pastures - Through a new understanding gained in the Jerusalem experience, the old idea of separation begins to break down, and the witness is carried to the Samaritans. Broken portion of city wall - Second degree breakdown of separation takes hold as the message is brought directly to the Gentiles. Globe circumscribed by light - The message of Christ's lordship is proclaimed to the whole world. 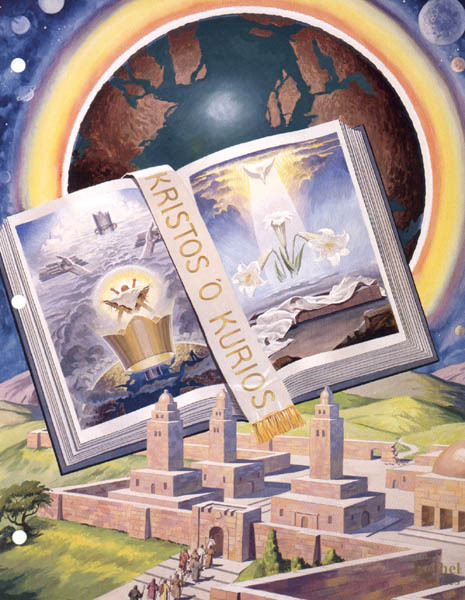 Xristos 'O Kurios (Christ the Lord) - Christ was, is, and ever shall be, no less than Lord, Sovereign, and King!